Right now, as Donald Trump inches closer to becoming the GOP presidential nominee, the country appears to be in the full throes of nostalgia for a different, seemingly simpler time — the 1990’s. So, what were today’s newsmakers up to in the '90s? Let’s take a look back at what today’s political movers and shakers were doing two decades ago. You probably remember that Hillary Clinton was First Lady, but did you also know that she caught a lot of flack for using her professional experience to help her husband's administration? Or that Scott Walker had just dropped out of college? Or — and brace yourselves, because I know this will sound completely crazy — most Americans thought it was downright nuts that Donald Trump was thinking about running for president? It was a time when Debbie Wasserman Schultz had just gotten on the political scene in her home state of Florida, and when a certain Independent from Vermont had a bit part in an indie comedy that gives Larry David a run for his money. While the '90s definitely seem like much simpler time in hindsight, they weren't without their share of controversy, progress, and humorous moments. Check out what today's influential politicos were up to back in the day. Apologies in advance for the avalanche of photos featuring all the cringe-y fashion that you've been trying to block out of your mind since 1999. McConnell started out as more of a moderate, but has drifted towards the right during his tenure in the Senate. There were hints early on; he spent a large part of the 90's campaigning against campaign finance reform, and really, really wasn't a fan of the bipartisan McCain-Feingold bill. 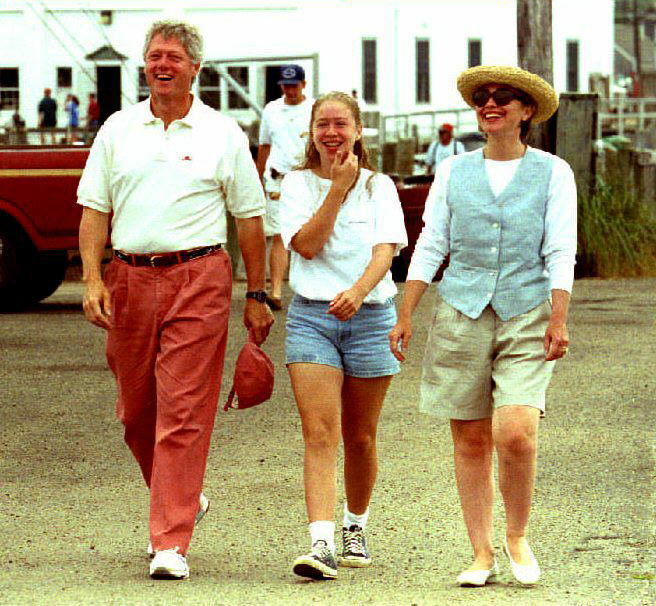 Clinton spent the better part of the 1990s as the First Lady: first in Arkansas and then in the White House. As arguably the most active professional to hold the office since Eleanor Roosevelt, Clinton leveraged her training and experience as a lawyer to make policy recommendations, most noticeably in the Administration’s health care, welfare reform, and foreign policy efforts. Walker dropped out of Wisconsin’s Marquette University in good standing, 34 credits shy of a degree, in 1990. Walker hasn't elaborated on why, but the '90s were a time when it was possible to start off on a professional career path without completing a degree, as Walker did. He started working for the American Red Cross after a part-time job for IBM landed him with marketable experience and good connections. Walker was elected to the Wisconsin State Assembly in 1993, representing the 14th district, proving that a lack of a degree wasn't going to dampen his ambition. Warren was teaching at University of Pennsylvania Law School as a full professor and got an endowed chair position in 1990, when she became the William A Schnader Professor of Commercial Law. A few years later in 1992, she was the Robert Braucher Visiting Professor of Commercial Law at Harvard. She left Pennsylvania for good in 1995 for Harvard, where she became known as an oft-cited thought leader in bankruptcy law. Despite running several business ventures into the ground in the '90s, Trump already had his sights on the highest office in the land. In 1999 he launched an exploratory committee to see how people reacted to the idea of a Trump White House, and thankfully, CNN decided to go out and ask ordinary Americans their thoughts on a Trump presidency. Check it out, and enjoy being transported back to a better, simpler, time. Some of Trump's epic failures from the 90's include Trump Shuttle (ceased operations in 1992), Atlantic City's Taj Mahal (first bankruptcy filed in 1991, a year after they opened), and suppressing a 1991 documentary called Trump: What’s The Deal? that explored the business tactics of the controversial developer. RBG spent the first three years of the '90s sitting on the DC Circuit Court of Appeals, the same court that SCOTUS nominee Judge Merrick Garland is currently chairing. In 1993, she was appointed to the Supreme Court after being recommended by Attorney General Janet Reno, according to Jeffrey Toobin's 2007 book The Nine: Inside the Secret World of the Supreme Court. Widely regarded as a moderate choice, Ginsburg’s appointment brought more variety to the bench, and the first Jewish justice since the '60s and the second woman ever to sit on the court, after Justice Sandra Day O’Connor. Sanders was first sworn into the House of Representatives in 1991 and spent the better part of his early career building up the Congressional Progressive Caucus with the help of his wife, Dr. Jane Sanders. Sanders also landed a bit role in the 1999 indie comedy, My X-Girlfriend’s Wedding Reception where he played the part of Brooklyn Rabbi Manny Chevitz (heh) who had a lot to say about baseball. Chair of the Democratic National Committee Debbie Wasserman Schultz became the youngest female legislator in Florida history when she was elected to the Florida House of Representatives in 1993 at the age of 26. The recent graduate — Schultz got her MA in Political Science from University of Florida at Gainesville in 1990 — won Peter Deutsch's seat with 53 percent of the vote. She spent eight years in Tallahassee as a representative before winning a place in the state Senate. Emanuel started out the 90's as a key element of Bill Clinton's 1992 presidential bid. He headed up the fundraising arm of the campaign, and helped the Arkansas governor rake in record-breaking amounts of campaign cash. After Clinton was sworn in, Emanuel was appointed Assistant to the President for Political Affairs before leaving the administration in 1998 with the title of Senior Advisor to the President for Policy and Strategy for New York based investment bank Wasserstein Perella & Co. for two and a half years. Just goes to show you that the more things change, the more they stay the same.